Situated just below latitude 45° south, the Dunedin Botanic Garden Camellia Collection is the worlds’ most southern ‘International Camellia Garden of Excellence’. 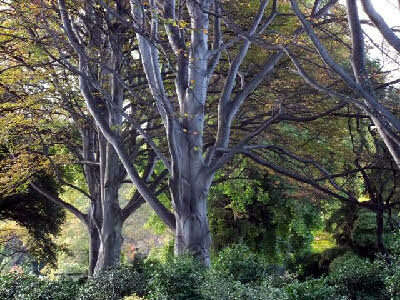 Dunedin Botanic Garden covers an area of 28 hectares from 25m to 85m above sea level. It is divided into two quite distinct areas. The larger ‘upper garden’ provides varied topography on a sunny north facing hillside. The formal ‘lower garden’ is where the Camellia Collection is located. Bordered on two sides by streams, this flat plain of alluvial soil is friable and well-drained and perfect for camellias. The collection numbers just over 500 individual camellias with each major botanical group well represented. Most of the cultivars are represented in the Garden by one plant only, meaning a huge variety of cultivars are displayed. There is an emphasis on New Zealand and Australian bred camellias. The collection has a few plants which date back from the 1950’s and 60’s but the largest number were planted during the heyday of New Zealand camellia breeding in the 1980’s and 90’s. Important species used in breeding, such as Camellia japonica, C. saluenensis, C. pitardii and C. sasanqua are planted with their related cultivars. The remaining 50 or so species plants are displayed in two borders designated for this group. Apart from a few earlier plantings of C. yunnanensis, C. tsaii, C. transnokoensis most of the species in this garden have been planted within the last 10-15 years. The camellia collection forms a significant planted landscape feature around the perimeter of a large formal lawn making up just over an acre (0.45 hectares) of cultivated land. Half the area is open and sunny with the remainder being shaded by a diverse selection of large specimen trees planted in the late 1800’s. The Botanic Garden maintains close relationships with the local, national and International Camellia Societies, locally entering show blooms and creating displays of camellias. Tours and talks are available from staff and each year we hold the popular ‘Dead-headers Picnic’, when volunteers come and help dead-head the camellias followed by a well deserved picnic and cup of tea, (Camellia sinensis)! 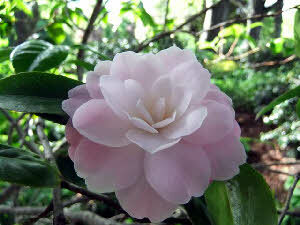 Early September into mid October for the spring flowering camellias and May-July for the sasanqua camellias.